O de Casa Hostel Bar i Sao Paulo, Brasilien : Boka nu! The group will be contact for a charge of 50% at the moment of the booking and this is a non refundable amount. Apart from that, a 7-days cancelation policy will be applied for the remaining amoung. Ô de Casa is one of the few authentic travelers' hostels in São Paulo and our mission is to promove awesome experiences for your out-of-home days . Our atmosphere is chilled, relaxed, spacious, bright, alive, cozy, and our well-informed staff can help you get the most from your stay in SP. 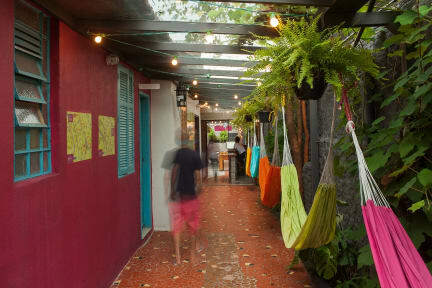 Ô Bar do Hostel is a great place to feel the social vibe of Sampa. Delicious Brazilian breakfast wakes you up every morning and caipirinhas color up our nights when it becomes a hangout for travelers and Paulistanos. Google it: Vila Madalena is the place to be in São Paulo. We are hostel lovers and travellers in business for over 10 years, and once upon a time we had kitchen and a free breakie. But you know how hostel kitchens tend to look like if you are a hostel with 80 beds. And you probably know that the standard for free breakfast in hostels is pretty low. So we made this decision to open THE BEST HOSTEL BAR IN TOWN and we serve you good brazilian food and drinks - with professional chefs cooking and all - at a CHEAP price. We make a huge effort to keep prices cheaper than elsewhere in Vila Madalena, and this way we make sure you get some good treats on brazilian food. One of the best hostel I've stayed at! The staff is amaazing and make sure everyone feels welcome. The bar is always crowded and you can get some cheap caipirinas. If you don't want to go out there's a common room where you can watch Netflix etc. great atmosphere and easy to meet new people. Also the hostel is very clean and is located in the best area in Sao Paulo. Wish I vould have stayed longer. The best hostel that we have stayed at! The staff are very helpful and friendly and the atmosphere was greate, always someone fun to talk to. The location in vila madalena was nice and close to everything. It was clean and the only negative thing was that the rooms were quite hot sometimes because of some slow fans. Really recommend this place! I had a really good stay at the o de casa hostel. Very good party atmosphere and the staff was very helpful and knew good english. Close to the sightseeings and vila madalena. You get one free capirinha as a welcome drink Which was nice! Great location in Vila Madalena, an area that feels pretty safe, about 45-60 min walk to Av Paulista. Hostel is clean and with comfortable rooms. Nice common areas and ok toilets and showers. Breakfast at hostel were great but not included in price. Very friendly & helpful staff and also they speek great english which made things easier. Recommended.